“Most mornings were spent from the top of the old log round pen, taking in the soft, warm light of sunrise. From there, I hoped to absorb Amber’s knowledge as if it rose up from the ground with the dust. Day in and day out, she worked with horse after horse, giving each one as much time and attention as it needed to progress in her training program. Whether it was one of her own or a client’s, every horse was met with compassion, and despite the array of challenges, her confidence always remained steady and strong. 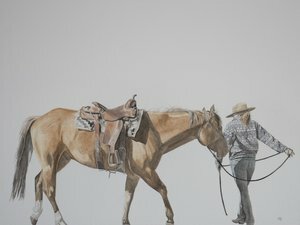 There’s a beauty in her wisdom, one that can be seen in the fluidity of her movements as she communicates with the slightest cues, and all the while the horse’s attention remains fixed on her.”This is how artist Melissa DiNino described the scene that served as a reference for her painting, “Amber”. “Women of the West”, her original watercolor series, was inspired by intimate, yet seemingly insignificant moments such as this. 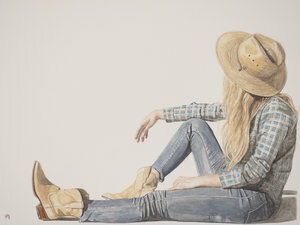 Each painting aims to embody the spirit and grace of modern women embracing a simpler way of life in the American West. Although not a native westerner, the twenty-six-year-old, self-taught artist has found a home in Montana and spent the past number of years living and working on different ranches across the state. After a long hiatus from artistic endeavors, Melissa was inspired to document her personal experiences through watercolor. The “Women of the West” series is on display at Katabatic Brewing Co. in Livingston, Montana through the end of March. You can also view the paintings on Melissa’s website: www.melissadinino.com. All originals are available to purchase.